So: the question is - when you're writing a review (or whatever it is you wanna call these - a "post" or blah) about a children's book: should you try and adopt the perspective of a child (which - I dunno - means kinda stunting your brain a little I guess) or - should you approach it the same way that you look at everything else? I'd never heard of A Wrinkle in Time until I saw it sitting on the shelf in our Children's Library: but seeing how the back cover has a quote from big-shot James Patterson  on the back cover: I figured it must be kind of a big deal. 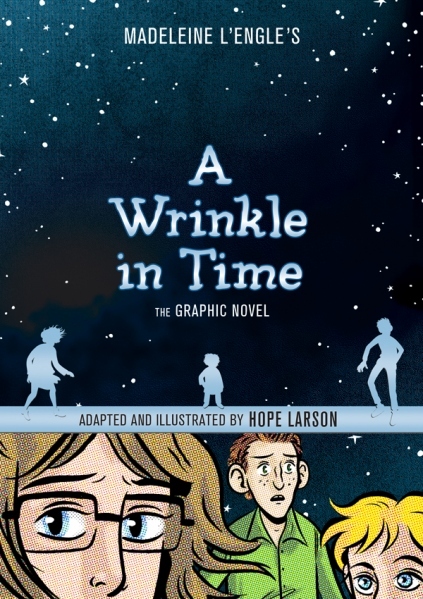 And well - I mean: just the way it kinda announces itself on the cover "A Wrinkle in Time: The Graphic Novel" (like that's supposed to mean something important) I got the feeling that maybe this was a like an American thing that had failed to make it's way across the pond . Speaking to a couple of American friends over the weekend it turns out that - oops: yep: that's exactly what it is. Described as "required reading for bookish teenage girls" it turns out that A Wrinkle in Time is merely the first installment in the "Time Quartet" (which also includes (and I've gotta say - these are some great titles): A Wind in the Door, A Swiftly Tilting Planet and Many Waters): so I guess these are like proto-Harry Potter books: mixed with some A Series of Unfortunate Events, a pinch of Enid Blyton and a daub of The Lion, the Witch and the Wardrobe: you know - bookish kids have a series of adventures and in doing so come to learn a bit more about themselves and their place in the world: what could be simpler (and more fun) - right? 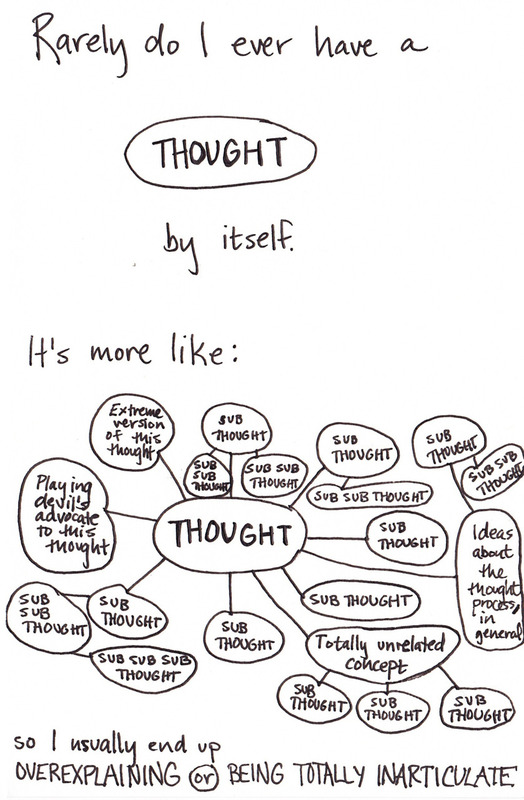 Well: yeah. Only for me it turns out things weren't that simple. I mean: it's a pretty common cliché at this point that England is the 51st State of America. And speaking as a (relatively) normal citizen of the UK  my whole life has been absolutely saturated with every possible form of American media: I mean - I could write you a list of all the books, films and TV shows I've obsessively consumed over the years but we'd probably be here for quite a long time... (and I'm sure we've both got better things to do - yeah?). Point being: it's a little bit weird to come across something like this book (or - well: - and I should keep reminding myself of this - the graphic novel adaptation of a book) that has completely escaped my detection: it's a bit like - I dunno - finding a whole new type of chocolate bar or something you know? I mean: it's not that I want to be eating all the chocolate in the shop: but at the very least I thought I knew what the names of all of them were. But whatever - nevermind. So - there's this book - what's it like? Most of the famous English children's books are about discovering a secret door to somewhere: Alice and the hole in the ground, Peter, Susan, Edmund, and Lucy looking inside their clothing receptacle, Harry messing around in Kings Cross etc : I'm having trouble trying to sum up the right words to explain the feeling - but there's something kind of quaint about the way that the adventures start: small, humble beginnings that aren't really about much more than tottering about the countryside and maybe having a nice picnic somewhere . Walking into the pages of A Wrinkle in Time with no clue as to what awaited me inside I just kind of assumed that it would be about conjuring the same feeling: doing things on a small scale without too much fuss and bother: but if your traditional "English" children's book is a small scone with a small dollop of jam and cream on the side then A Wrinkle in Time is a mountain of ice cream and cake all mixed together and served in an extra large "big gulp" serving: and (for once) I don't mean that in a good way. Nah: it's more to say that instead of treating the world as this big mysterious thing that even if you lived to be 100 years old you'd only be able to really know one really really small part of it : A Wrinkle in Time flips things the other way and ends up - over the course of it's story - making the universe feel small and the main characters feel very very big. I mean - not that's a bad thing in and of itself: but it kind of added up with a lot of other things that left me feeling pretty distasteful with the whole thing by the time I finished it - like a fly had flown into my mouth and I had to scrub my tongue to wash the flavour away (you get what I mean?). I mean (well): as this blog has gone on and on - the more I've been interested in stories and what they mean and how the work - and all that kind of stuff goes double (triple!) for stories intended for children. After all - when you're new and fresh-faced your brain is all mushy and easily absorbent - which means that the lessons and ideas that get manage to get purchase at that point will be very much wedged in their for the rest of your life... (I could very much belabor this point and write several mini-articles: but let's keep moving on yeah?). Because - yeah: with that kind of stuff in mind - there's a lot in A Wrinkle in Time that is - well: troubling. I mean I don't want to spoil it all for you - but the fact that there's a moment where a character is trying to think of something in order to keep herself from being brainwashed and ends up relying upon reciting the Declaration of Independence is - well - I'd say it's a little bit messed up - no? And further from that (and this is where I'm going to get a little bit liberal and tree-huggy - so you know: apologies): it's damn strange to have the one of the main antagonists be a great massive blob of evil ("The Black Thing"). I mean yeah: it makes things a lot simpler for a story just to have an evil blah and then use that to drive the story forward: but I can't shake the feeling that a way more - well - human - story would show that people aren't just bad because they're born or made that way  - but that rather: everyone has their reasons and "evil" is mostly just used as a stick to beat someone into silence when they don't want to take the time to understand them . And then the whole thing ends (and this is very much a spoiler so erm yeah: maybe turn away now): on the idea that love is a finite resource and you shouldn't waste it on people that aren't your family: like - yeah: I think I know understand a little more about why America seems like it's so messed up . But hey: even if it's morally wrong (or however you want to phrase it) - I will admit that (for that very reason) it makes pretty interesting reading. And it's whole strange science-fiction fantasy mishmash (so it's not really clear where one ends and the other begins) - not to mention the crazy seeming free-associative leaps in logic - (and - what the hell? - it's called A Wrinkle in Time (and is sold as a time-travel adventure): but there's no damn time-travelling) gives the whole thing a feeling like you're inside someone's head watching them dream. I mean - if (for whatever reason) I'd been reading the book then I would have felt been pretty irate that I'd allowed it to trespass in my mind: but hey - seeing how it's just a comic book (so: in and out in about a hour) there's no proper sense of invasion (a proper book is like a home: a comic is more like a fun place to visit - no?). You haven't heard of James Patterson? Well - according to most surveys he's the most borrowed authors in English libraries (and probably most other countries too I'd imagine): and every library I've worked in has always had about three or four shelves (at the very least) dedicated to his oeuvre. What bread and milk is to corner shops: James Patterson is to libraries: you know - he's one of the essentials. Man: I must say - I love using that expression. There's something so powerful about referring to the Atlantic Ocean (the second-largest of the world's oceanic divisions with a total area of about 106,400,000 square kilometres (41,100,000 square miles) it covers approximately 20 percent of the Earth's surface and about 29 percent of its water surface area) as a "pond." (ha). Yes. I know that the United Kingdom and England are two different things - but I wanted to avoid the boring repetition of "England, England, England" - ok? And "UK" sounded good - and whatever. Although I guess I should admit that my only experience of Harry Potter comes from half-watching the first two movies. But yeah - whatever. You're not going to hold it against me are you? Actually - well: I guess with my three examples I was hoping to set a kinda precedent of typically English children's stories - but now I consider it a little bit more I realise that it's only really Alice that fits the template that I was hoping to make: just an average nobody who accidentally falls down into a strange magical world - does some stuff - and then leaves. As opposed to The Lion, The Witch and The Wardrobe where the kids (sure) are nobodies are the start (well to do nobodies - but still nobodies) but then they end of being best buddies with Jesus (which is a bit much I must say): which is a touch too grand and ostentatious - which then leads to Harry Potter - where it turns out (and this is right - right?) that the main character was Jesus from the start and was just waiting for the rest of the world to catch up - right? (Right): which to me seems like small scale Englishness (as I imagine it) and more like - well - something that stems more from an American way of seeing the world ("I am so smart! I am so smart!" etc). I guess the things I was thinking of was more: Peter Pan, Wind in the Willows, The Tale of Squirrel Nutkin - that kind of stuff. But yeah - whatever. Maybe none of this makes sense (oh well). Which reminds me of this cool mini-article here: "I think the famous opening shot, seen above, contains the answer. Star Wars was big. As big as I could imagine things being. Maybe to imagine a bigger thing was in fact impossible. Maybe this introduced and thus defined the very concept of bigness in my imaginative life." And if you want to say that type of thing isn't possible in a children's story - then I would respond by recommending that you watch pretty much any Studio Ghibli film. I mean - I know it's probably not very cool to quote Russell Brand - but he wrote a thing in the Guardian recently that basically sums up my current attitude (talking about the Daily Mail columnist  Melanie Philips) : "When the audience – who, incidentally, make all the best points – boo her, I think it a shame. The wall of condemnation is an audible confirmation that the world is a fearful and unloving place. Like most of us, Melanie just needs a cuddle." Daily Mail columnist being the nearest thing that the world has to being employed as an actual hate-spewing demon. Obviously (but you knew that already - right?). Ok yeah: so the actual book was written all the way back between 1959 and 1960: but that ain't no excuse. Links: Based on Nothing Review. Further reading: Mercury, The War At Ellsmere, Stardust, The Hobbit, Coraline, Anya's Ghost, The Unwritten, Promethea, Arrowsmith: So Smart In Their Fine Uniforms.